It’s 3:00pm on Monday, you are at work, and you are starting to get the mid afternoon munchies. You go into the break room searching for something healthy to eat, but unfortunately all you find is a half eaten store bought chocolate sheet cake left over from a co-worker’s birthday and some greasy pizza. Not wanting to rack up the calories, you wish for the 100th time that you brought a healthy snack to work. 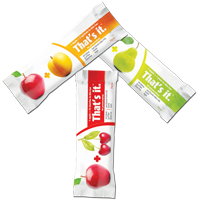 Time’s like that are the reason I’m reviewing the “ That’s it.” fruit bar. It’s a simple snack that is easy to throw in a bag or a desk drawer, so that’s it’s there when you need a quick snack. It’s a relatively healthy alternative to the snack machines, but it’s not perfect. What does “That’s it.” have going for it? The “That’s it.” fruit bar is a truly simple snack. Unlike other bars, you will not find added sugar, corn-syrup, saturated fat or a list of unpronounceable ingredients that look like they they belong in a science textbook. Instead, you will only find two ingredients, apple and one of three fruits (pear, apricot or cherries). Each of the three bars that Superfruit Nutrition sells are only 100 calories and have 3 grams of fiber. The bars are vegan, diabetic friendly, gluten free and raw. So far, so good. What’s the catch? They’re not organic. For some people, that’s no big deal. For me though, that’s a big thing. Especially since every one of their three bars features apples, which are the fruit with the highest amount of pesticides. Also, while they are only 100 calories, you still have to be careful because they are tasty enough that I could see someone eating a few with no problem. Plus, at about $20 for a box of 12, they aren’t that cheap. For those individuals searching for an easy, healthy snack that will give them energy, nutrition and curb their munchies this is snack will do the job. And it is definitely a healthier snack to give to your kids than a candy bar or most energy bars. I know my 3 year old loved this fruit bar. I’d take this bar over cookies and crackers any day, but before it would be on my short list of snacks, it would have to go organic. If organic isn’t a concern for you, you might want to give these a try. They are good but since they have either nuts or berries in them and, I am allergic to them, I can’t eat them. That’s too bad!